Paul and Nancy Pyle, of Pyle Dairy Farm, Inc., don’t just follow their passions, they use their passions to inspire others. 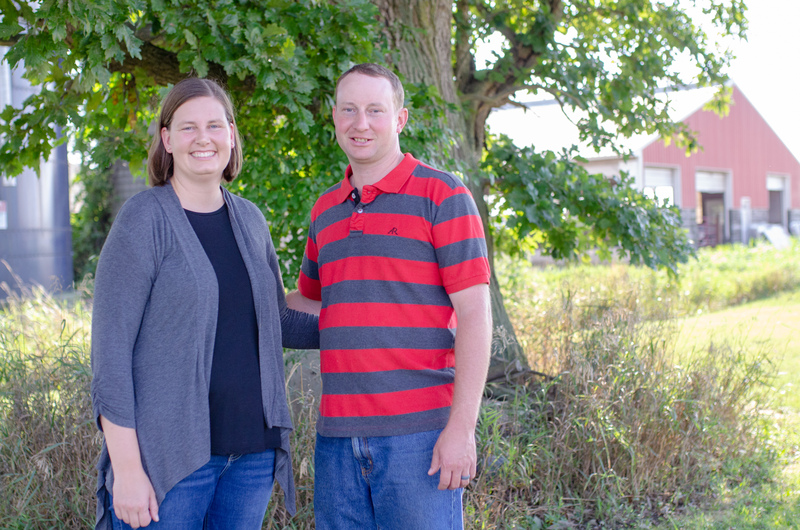 He’s a sixth-generation dairy farmer and she’s a preschool program director. Together, they built a life for their family on a 140-cow dairy near the edge of Zeeland, Michigan. “Let others build into you, while you build into others,” Paul adds. This pursuit led the Pyles to enter in the MMPA Outstanding Young Dairy Cooperator (OYDC) program. The 68-year-old leadership development initiative is a stepping stone for many cooperative leaders. This year, Paul and Nancy were named the winning OYDC and will go on to represent MMPA nationally. Paul spends his days on land settled 170 years ago by a 22-year-old Dutch immigrant. Paul — along with his father and brother — run a modern dairy farm, continuing the legacy of Paul’s great-great-great-grandfather Hendrick Pijl. Brought over to the U.S. on the boat Scandia, Hendrick was a co-founder of Zeeland and part of the wave of Dutch immigrants destine for West Michigan. But it’s not easy to sustain the lifestyle established six generations ago. New challenges and global pressures soar up the gravel driveway faster than the horses-and-buggies of 1848 ever could. Milk prices are globalized, not localized and dairy farmers today feel the implications of decisions made many miles from their farms. “I think [our family legacy] makes us quicker to endure the ups and downs of the farming industry. We’re not quick to give up this lifestyle. We believe God placed our family here for a reason,” Paul said. As Paul and his brother, Nate, became more involved in the farm, they increased their herd count to support three families. Responsibilities are split between the three Pyle men, with Paul specializing in herd health, nutrition and breeding. “The year we got married, we were still milking in tie-stalls,” says Paul, who married Nancy in 2004. In the months before the wedding, they built a new freestall barn and parlor and strategically doubled their cow numbers internally over the next five years. Today, they milk two times per day in a double eight parallel parlor using technology to monitor their production on the computer in real-time. Cow comfort is a core part of the farm’s mission, along with producing a high-quality product and being “good stewards” of their animals and land. They do a herd health check with their vet once per month and have written protocols to be ready for any situation. 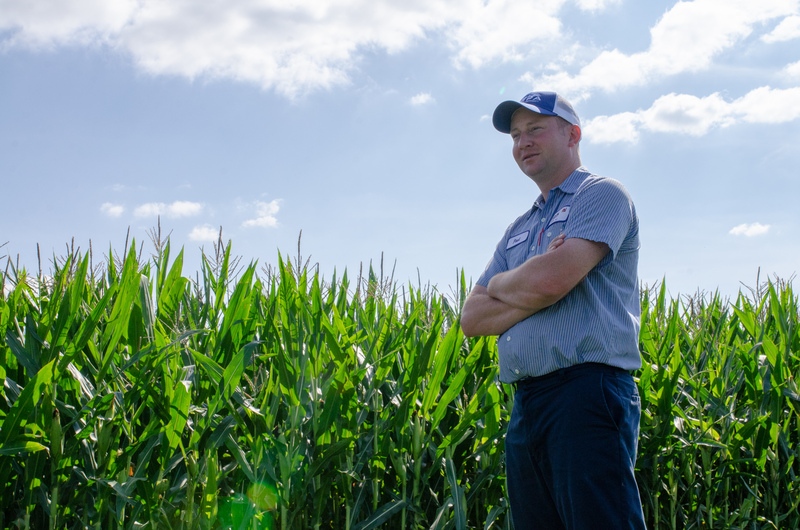 It’s been said, “if you love what you do, then you never work a day in your life.” For some that can be hard to imagine, but as Paul struggled to pick just one favorite thing about being a dairy farmer, he may be the one to embody the phrase. Nancy’s leadership in education also provides a supportive perspective in their life and on the farm. With two diplomas — a bachelor’s and master’s — in education, she has worked at Zeeland Christian Schools for over a decade and is currently the Preschool Director. “There’s a term in education called a growth mindset. People with a ‘fixed mindset’ think you can either do it or you can’t. A growth mindset means you think you can continue to learn and grow,” Nancy said. A growth mindset tends to thrive on challenges and views failure as a “heartening springboard for growth and for stretching our existing abilities,” according to psychology research. The couple attests in the dairy business, this personal growth mindset is needed to embrace challenges and continually improve through hard work. On Pyle Dairy Farm, new and evolving obstacles are addressed with this mindset. No one on the farm is a veterinarian, yet they’ve learned to diagnose illnesses, administer IVs and treat sick animals. No one on the farm is a trained mechanic, yet they’ve learned to seek answers and fix almost anything. And when the next thing comes along to shake up their farming practices, the Pyles will surely learn to “stretch their abilities” and find the right solution. The paramount for the Pyles is their children. They say their chief accomplishment won’t be from any success on the farm, but from raising their kids right. “That’s bigger to us than farming,” Paul said. They enjoy raising their five kids – Emily, Andrew, Megan, Chelsea and James – on the farm and the work ethic it instills in them. Nancy says she wants them to develop the growth mindset to be passionate and always learning and growing. Further, the seventh generation of Pyles is gaining a world perspective through their education. Paul and Nancy’s children are enrolled in a language immersion program and are becoming fluent in Mandarin Chinese. They are learning not only the language, but about Chinese culture from their teachers as well. All students at the school also receive Spanish language instruction. Just as the dairy industry is globalized, Paul and Nancy see how it’s important for their children to be able to connect with people from different backgrounds and cultures in their future. “If you can speak Spanish, Mandarin and English you can speak to 75 percent of the world,” she continued. The OYDC program is not the Pyle’s first foray off the farm. They both speak to the value of community and agriculture industry involvement. “For the guys it can be hard to think big picture when you’re so stuck working on the day-to-day tasks,” Nancy said. Paul was a board member and president of the Ottawa County Farm Bureau and is currently chair of the county’s policy development committee. He graduated from the Michigan Farm Bureau (MFB) ProFILE Young Farmer Leadership Institute and is on the MFB state study committee. Since 2015, Paul has been on the boards of directors for the Farmers Co-op Elevator Company and the Critter Barn. Both Paul and Nancy are active in their local church and Nancy holds leadership positions with her school. She is an early childhood education partner with Ready for School and an educational leadership team member at Zeeland Christian School. The couple looks forward to the further involvement at MMPA that starts with the OYDC program. The initial OYDC conference in August gave OYDC finalists a look into their cooperative through discussions with co-op leaders and a tour of the offices and milk testing laboratory. Up next for Paul and Nancy is participating in the Joint Annual Meeting of the National Milk Producers Federation and national dairy checkoff organizations.